Friday was a lovely spring like day with plenty of warm sunshine and lots of cumulus cloud marking the day's thermals. This led to some hope for Saturday but a close look at the forecast marked out Saturday as a non flying day. 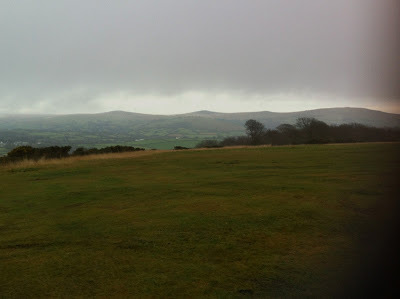 The sky was completely covered in low cloud with a strong, gusty, SW wind. 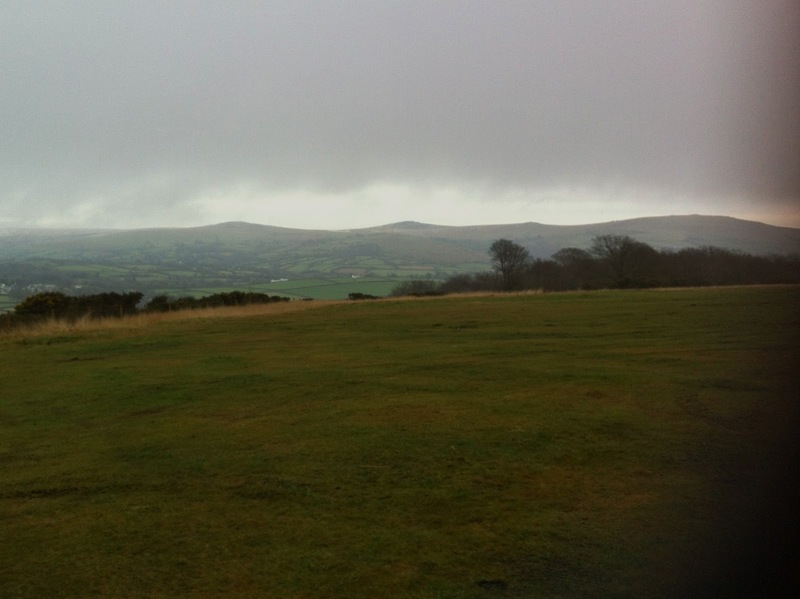 The low cloud darkened throughout the day until it rained. There were lots of club members in attendance. Were they sat around grumbling about the weather. 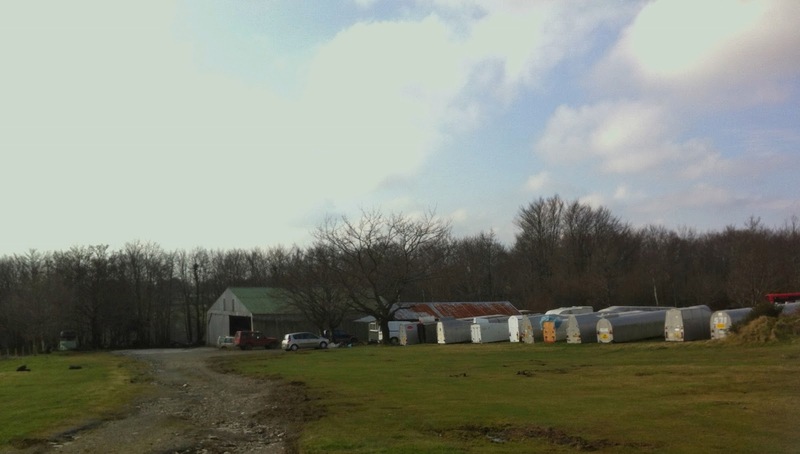 No, they were getting on with the myriad of jobs needed to maintain and efficient airfield and clubhouse. 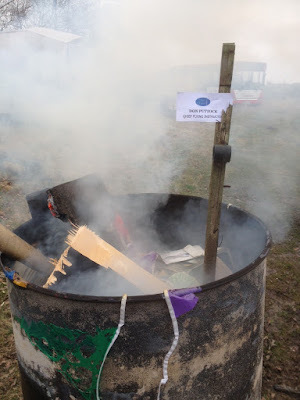 A large group, led by CFI Don, were clearing out all the accumulated paperwork, magazines, and dead equipment from the clubhouse most of which was then burned in the improvised brazier outside. 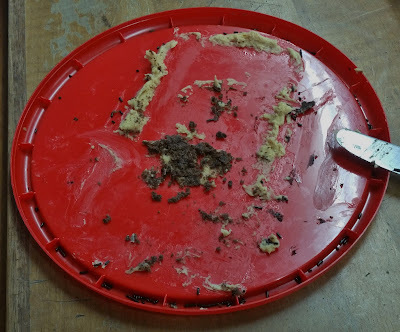 The sign inicates the leader of this work party. Ive heard of singing your work but this? Meanwhile, Mike was dealing with the large amount of logs that he brought to site. 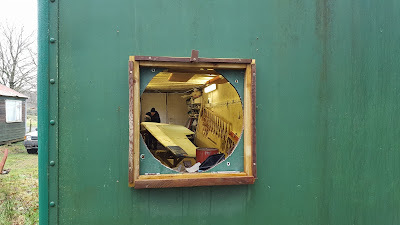 Robin was helping with this task tidying the wood store. Winch Master and Safety Officer, Stratch, was to be found underneath the "new" ML winch servicing the brakes. Treasurer Steve Raine and I went on a strop hunt along the North side of the airfield in amongst the gorse. We found 2 of the missing strops which were repaired and returned to the launchpoint. Site Officer Jorg spent his time inspecting and repairing the perimeter fence. 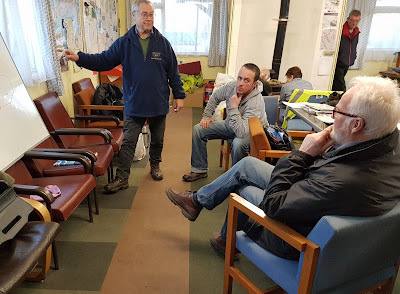 There was still plenty of time to retire to the clubhouse for tea and biscuits while catching up with the latest plans and gossip before the forecast rain set in at which point it was time for home. A busy day amongst friends. 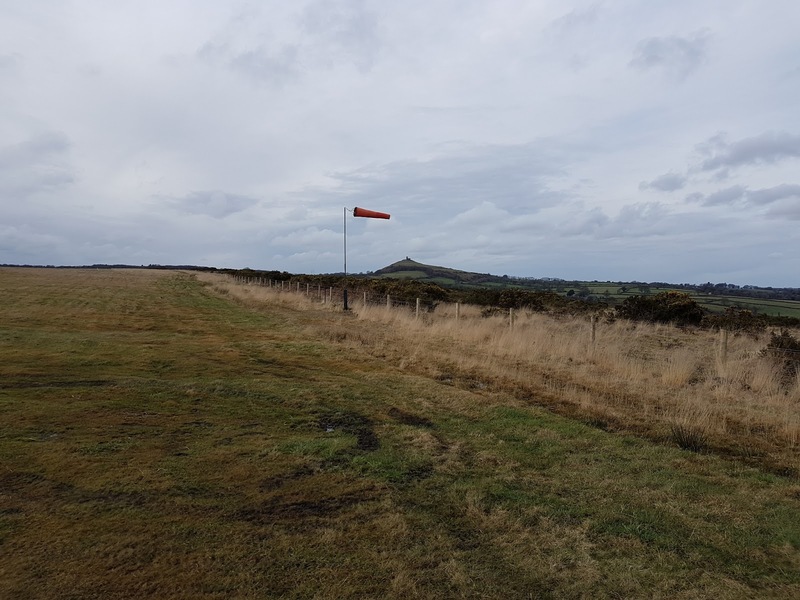 An occlusion snaking N-S across the west of UK did not make for comforting reading on the Met Office F215, but on arrival at the airfield, the cloud-base being just greater than ‘tor height’, and the wind a mere zephyr, there was nothing to prevent us from flying – and so we did! But that was not the only business of the day: first we had to celebrate our Inspector, ageing rock star Colin Boyd’s birthday. 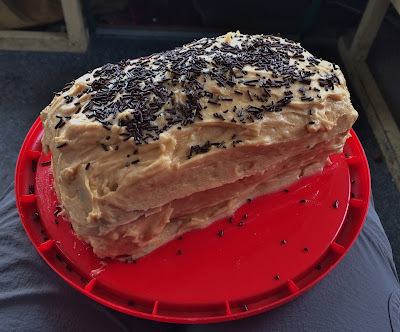 This we did with a delicious chocolate and peanut butter sponge generously provided by Paula Howarth, which was gratefully gobbled by all attendees, some of whom were almost moved to a twinge of regret that Colin wasn’t there..! Colin, who normally arrives at the sort of time you would expect from an ageing rock star, was at home convalescing after his recent hip replacement operation. and after ... a pity he wasn’t there to enjoy it..! Once we had got the airfield re-arranged for the south-westerly that was predicted (and duly arrived) we got going with club trainees Dave Downton and Ed Borlase taking the K-13s whilst Roger Appleboom took the club K-8 and Leith Whittington flew his immaculate Dart 17R. Cloudbase was, it must be said, ‘variable’, causing Roger A on one occasion to disappear for severeal seconds. 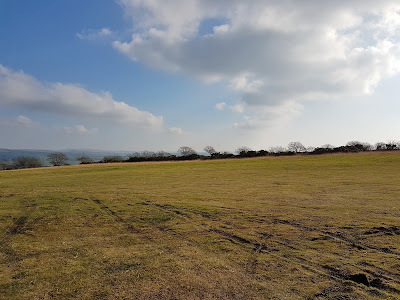 With no visitors to cater for today provided an excellent opportunity for members to practice launch failures, thus remaining current for when the season begins. 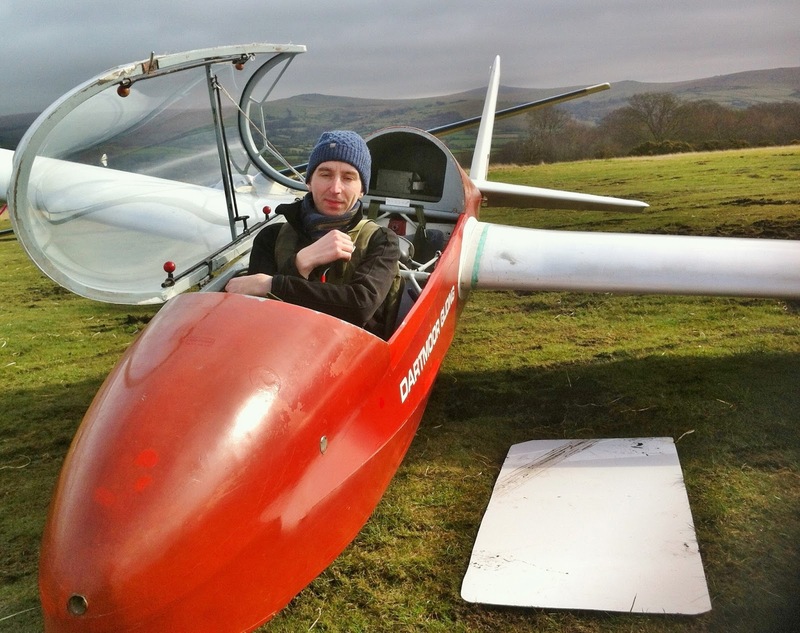 Ed Borlase prepares to commit aviation. 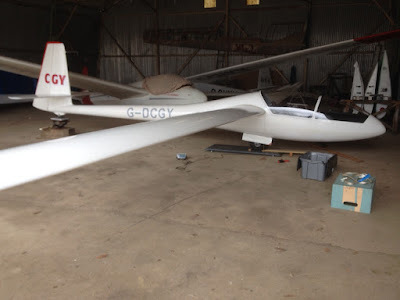 All was proceeding smoothly until, at the stroke of 2:30pm (‘precisely..!’) the occlusion arrived, dropping cloudbase to the deck and soaking us all within 5 minutes. 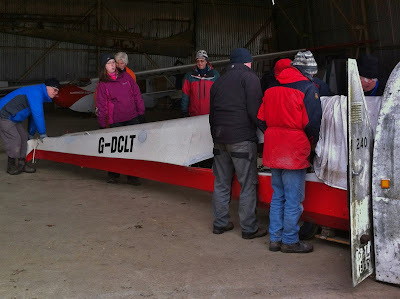 And so it was a long and sopping wet trudge back to the hangar to squeegee off the gliders before we could reward ourselves with steaming hot cuppas all round. The occlusion swept in within 5 minutes. Thanks go to Inspector’s Apprentice Dave Downton who, loyal to a fault, saved a piece of birthday cake for Colin – for doorstep delivery on his way home! Today started with mist and a little low cloud ( just like an autumn day really). 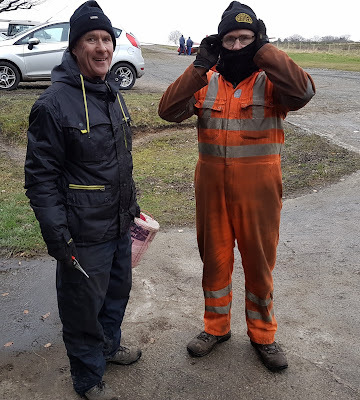 The small but willing assembly of members at the airfield got on with changing ends to suit the SE breeze and by 11am the visibility had improved sufficiently for flying to commence. Today's instructor, Gordon, was kept busy with training and check flights, ensuring the winter reduction in flying opportunities had not taken the edge off our pilot's skills. The K8 was kept busy by the solo pilots. Even though the wind was south to south east, a direction which often produces a lively approach, flying conditions were gentle. 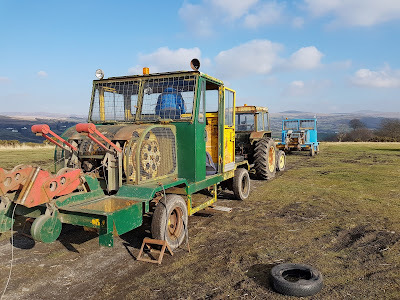 Is there a collective name for winches? A tangle of winches perhaps? After a quick winch change at around 1pm the sky was suddenly looking better. A cloud street had formed and Allan Holland was quick to take advantage with a soaring flight of 43 minutes in the K8 only returning to let other pilots have a go. The cloud streets that supplied some much longed for soaring. All too soon the temperature lowered and the canopies started misting so time to put everything away once more. Gordon wasn't quite finished though and a talk on circuit planning was delivered. Was this the end of the day? Well no, step forward the club committee whose meeting stretched on into the evening; eventually ending around 8pm. Thanks today are due to every one who help to make this day a success, especially, Barry and Mike for the winching and Heather for driving the retrieve once again. Heather drives the retrieve so often perhaps we should put her name on the side of the Discovery?. Sometimes it's difficult to say “no”, and sometimes objective judgement is clouded (ha, ha) by the forecast. Today's Met Office forecast was definitely for “no”, with winds of 30 kts predicted, but looking at the photo of the trailer park you'd be forgiven for thinking that the day was perfectly flyable: the photo does not, of course, show how quickly the clouds were moving from north to south across our east-west runway. 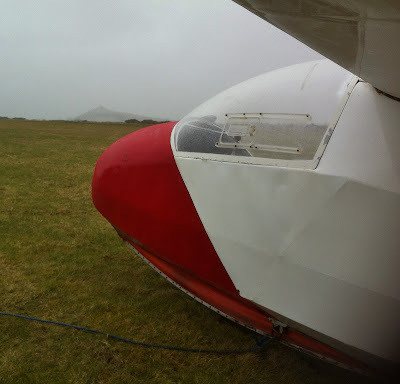 It may have looked fine, but gusts ripped across the airfield. So another day with our head in the books, this time for the benefit of Ed Borlase, who revised fundamentals of flight and how a wing works while Dave Downton and Roger Appleboom applied themselves to next season's cross-countries. 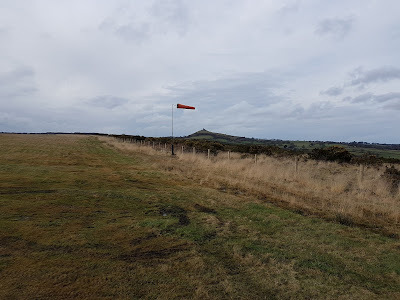 Speaking of which Mike Gadd has very helpfully posted some short cross country triangles up on the noticeboard just inside the clubhouse door to help us get into the cross-country mindset whilst remaining within gliding range of Brentor. 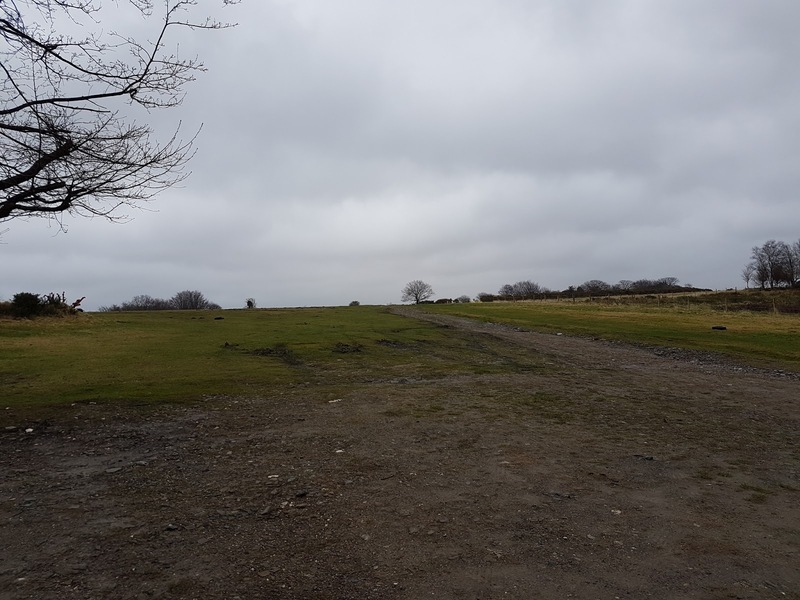 And for those looking for their Silver Distance Rich Roberts has discovered a farm strip which is exactly 52kms from us, just south of the Cornwall Services on the A30, near Indian Queens. So if we get an easterly, that could be the goal for you. In better viz it would be just to the left of Pew Tor (centre). And speaking of unexpected occurrences (Launch Failure!) - are you in date..? If you cannot remember the mnemonic 'ASDA', then please rehearse it before you return to the airfield. 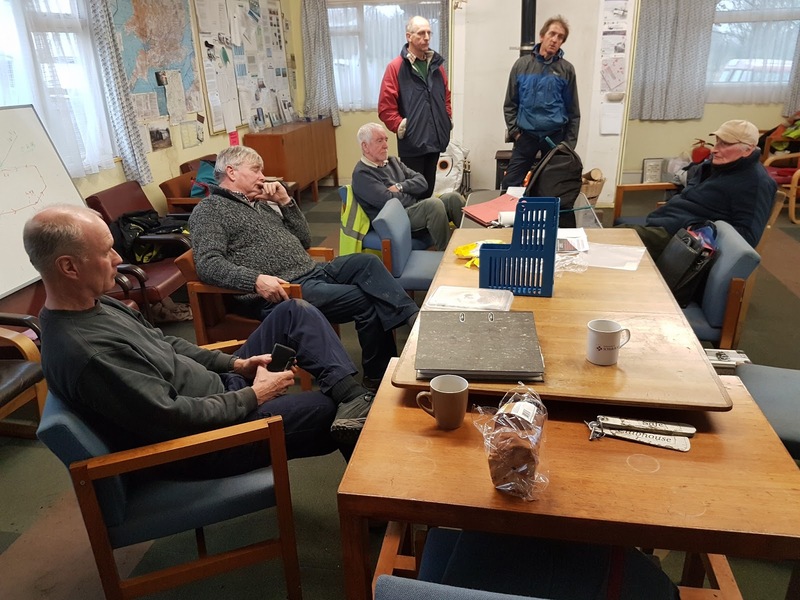 Not the weather that had been forecast so Rick went looking for his skis whilst everyone else got the fire going and a made a brew. The snow flurries died down enough that Rick and scratch worked up on the field on the winch and the big mower. Meanwhile the remaining members help prepare the hangar and help rig Mike and my Open Cirrus for weighing under the direction of Steve Lewis and the watchful eye of Ged. 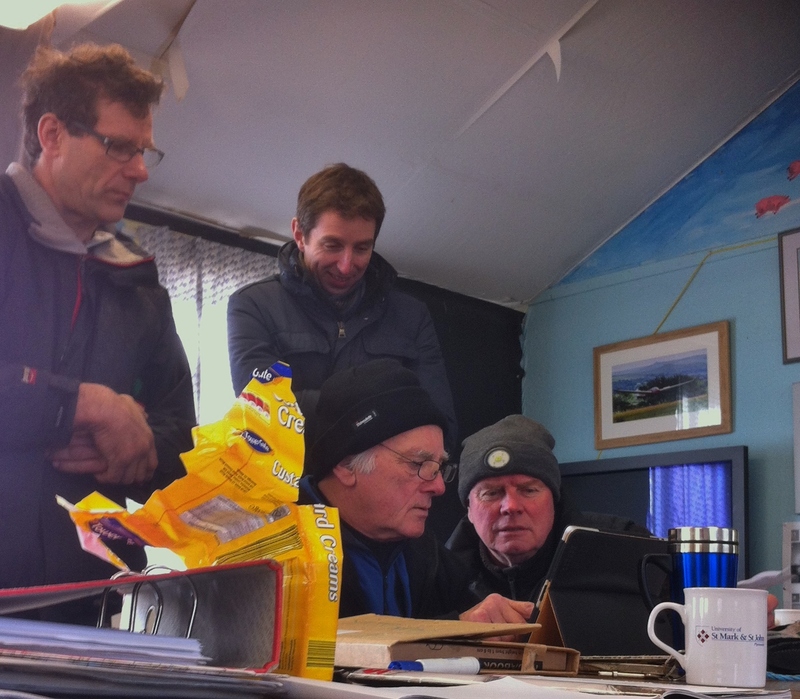 This all went remarkably well so drinks all round in the clubhouse afterwards. No flying though! Low cloud prevented an early start. Actually it wasn't until early lunchtime (or Rich Roberts’s breakfast No3) that the low cloud-base began to lift and some patches of blue began to appear, by which time a fresh northerly wind had sprung up – not out of limits, but enough to provide a test of the team’s abilities. And to add to our problems (of course…) the ground was very soft, and so the challenge was how to get through the Flying List with the least number of ‘transactions’ across the launch/landing area. At which point up steps Roger Appleboom with the bright idea (aren’t they all…) of ‘doubling up’ ie. manning the K-13 with two pilots (where permissible) who could swap roles of PIC over two launches. 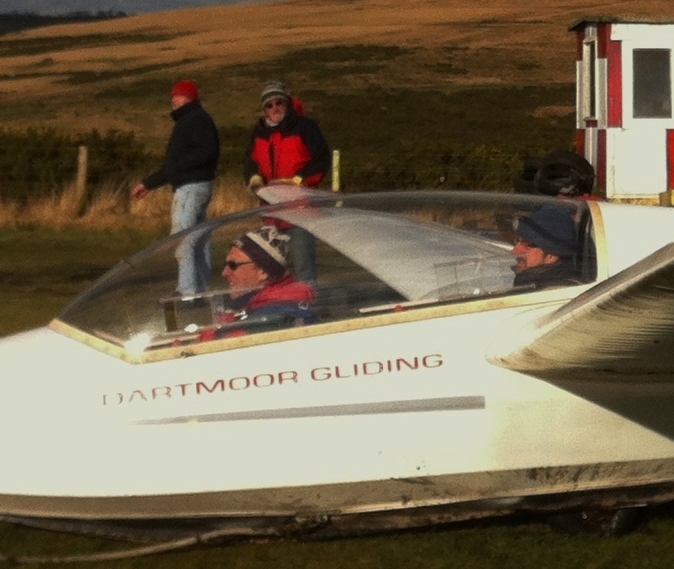 Steve Fletcher and Rich Roberts fly for the first time together. 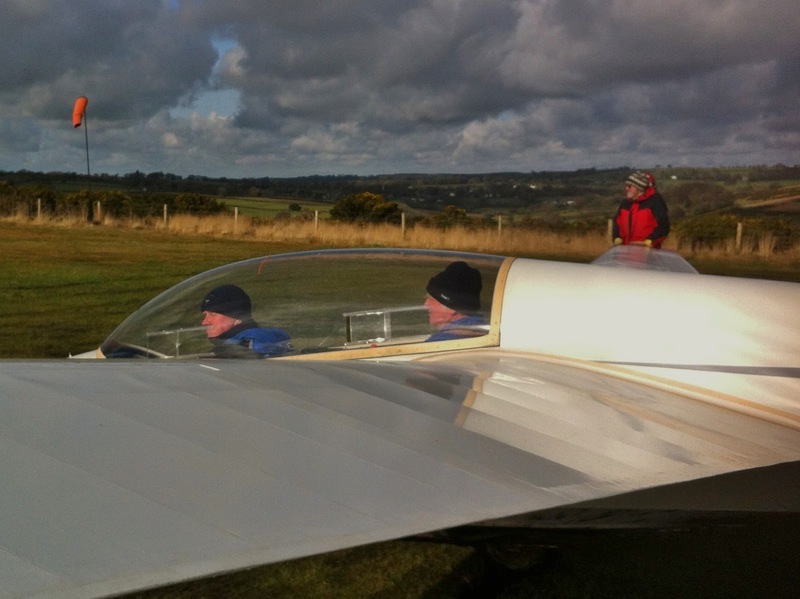 Roger Appleboom pilots HXP whilst Dave Downton samples the back seat. 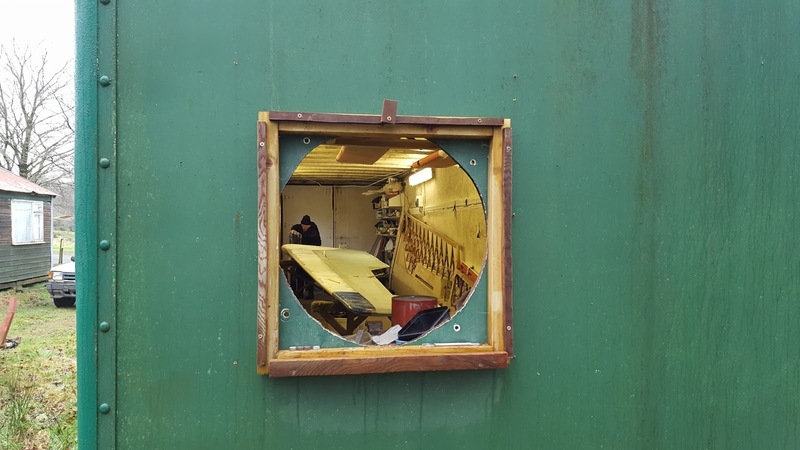 Can you see Apprentice David at work on the K-13's wings? With the torrential rains and gale force winds of the last couple of days, it was definitely looking unlikely that we would fly today. But Saturday dawned with blue skies and light variable winds. Careful study of the forecast indicated that this would be a brief respite before the next front arrived around mid afternoon. So the airfield was readied for as much flying as we could fit in. The scouts from the 6th Plympton group with todat's pilots. Today we welcomed visitors from the 6th Plympton Scouts looking to earn their aviation badges. 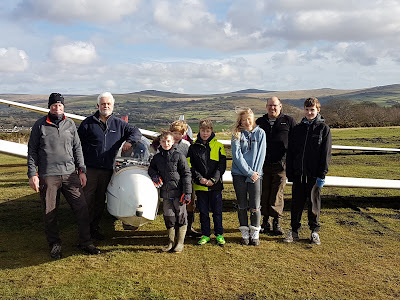 We started the flying programme with enthusiasm and the first flights were completed in beautiful ( but cold ) conditions with very smooth air aloft and some great views. for our visitors to enjoy. Unfortunately just before 1pm the wind suddenly built to 15 knots+ from the south as the approaching front made it's presence felt and we reluctantly called a halt to the flying. The scouts who didn't fly will be returning next week. We did, however manage to help complete three aviation badges which we had great pleasure presenting. The scouts were not the only visitors today. 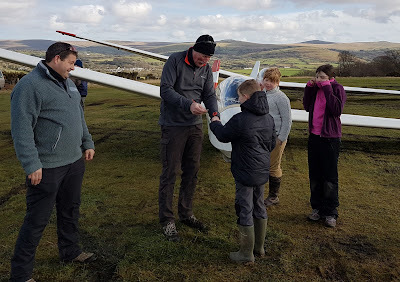 We also had a visit from a large group of cubs who spent their time watching the glider launching, inspecting the aircraft and using the simulator. Great fun. Just after the aircraft were cleaned and returned to the hangar, it started to rain. 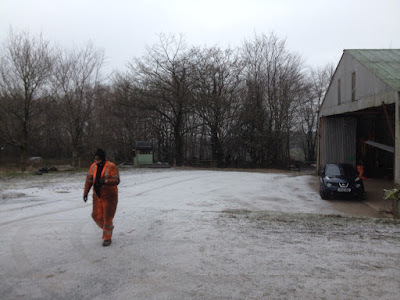 This very quickly turned to sleet and snow which was our encouragement to leave for the day. Many thanks to everyone who helped make this day a success.